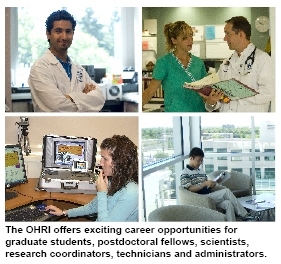 The OHRI offers a wide variety of exciting career opportunities, including training positions for graduate students and postdoctoral fellows and staff positions for researchers and administrators. Use the search tool below to browse through our current job and training opportunities, or email our scientists directly, should their particular field of research be of interest to you (see scientist profiles for more information). If you are interested in a training position, you may also want to consult our web page for students and postdoctoral fellows. If you are interested in opportunities in health care as opposed to health research, please visit The Ottawa Hospital career opportunities web page. Please note that we will not respond to unsolicited CVs sent to the general information email address. We thank all applicants for their interest. However, only those invited for an interview will be contacted. The Ottawa Hospital Research Institute is an equal opportunity employer. Upon request, accommodations due to a disability are available on the job and throughout any new selection process.